"I've now purchased this arrangement twice for a gift. Fresh fresh fresh flowers! Amazing packaging! Perfection!" There’s truly nothing quite like a homemade meal prepared with freshly picked herbs. Full of flavor, culinary plants bring beauty both to the plate and to the kitchen. 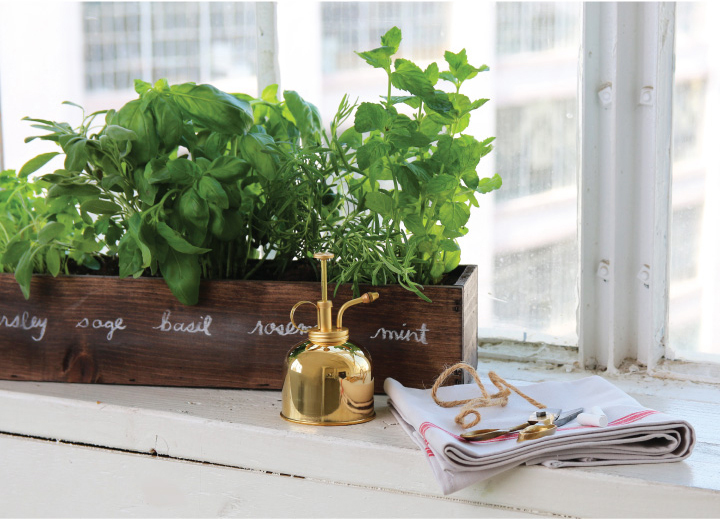 Learn how to cultivate a windowsill herb garden with these expert indoor gardening tips and enjoy the bounty all year long. 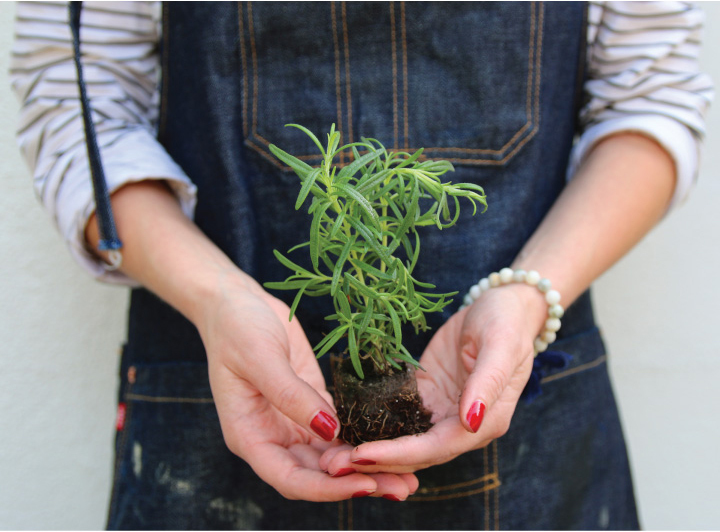 Whether a row of terra cotta pots or a modern planter, a freshly potted herb garden adds natural style to your kitchen. The vessel you choose should be at least 4 inches deep and have proper drainage in the bottom for the plants to thrive. For our container, we repurposed the dark stained hand crafted wood trough from our Bianca Grace flower arrangement after the blooms had faded and drilled a series of holes in the bottom. If you plan on adding multiple plants to one container, make sure they each have enough room to grow, and avoid overcrowding. When selecting herbs, choose versatile varieties that thrive all year long. 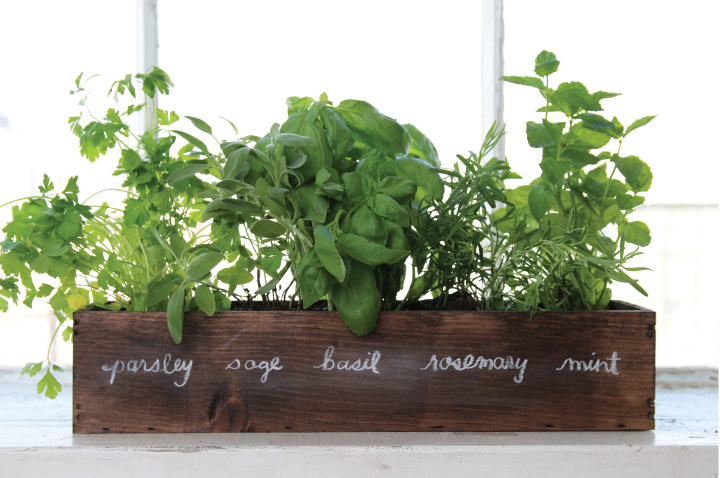 Basil, dill, oregano, thyme, parsley, sage, rosemary and mint are all great options. While they may be grown from seed, we find it a little easier to purchase herb plant starters, which can be found at most garden or grocery stores. Fill your planter with a high quality potting mix. Heavier “potting soil” can be too sticky and not provide enough drainage. Potting mix is typically lighter and made from mostly organic matter that gives herbs the texture and drainage they need. Once your container is filled, dig holes just large enough for each plant. 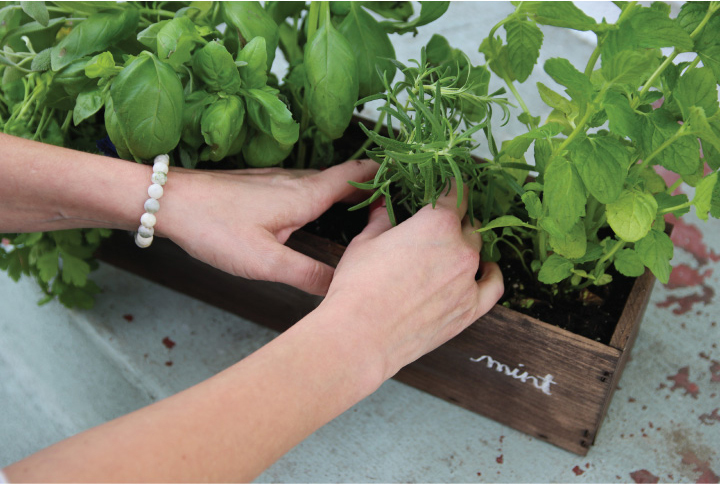 Gently pull the plants from their starter containers by turning them upside-down and tapping the bottom until they come out. Place the plants in the holes and gently cover with soil, pressing around the edges. Since your new little plants won’t be outside, they will need to be placed in a window that gets lots of natural sunlight. A sunny south-facing window is ideal, but any spot that gets ample light will do. 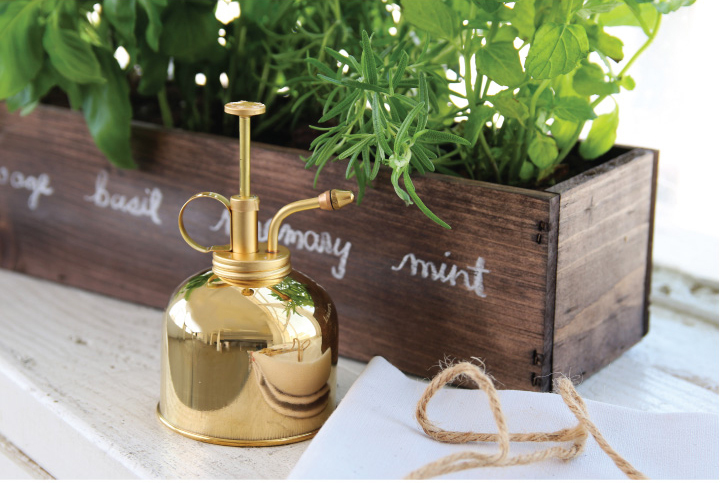 In general, herbs need about 4 to 6 hours of direct sunlight to thrive. Herbs like it best when their soil is kept moist, but not soggy. An easy trick to gauge whether or not you need to water is to stick your finger into the first inch of the soil. If you feel moisture, don’t water. Keep checking once a day until the soil feels dry. Then, add water until you see the excess start to drain from the pot. Watch them grow and enjoy! As the plants start to grow, harvest and use the older leaves first. This will keep new leaves coming. Then, add to your favorite dishes and delight in the freshly picked flavor!